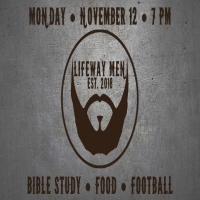 Lifeway Men, come out and join us for Food, Football, and Bible Story. Men, this is a great a opportunity for us to get together and be there for each other in our walk with Christ. Build each other up as we lead our households and lead our communities. A great time to fellowship and eat and watch some football! See you November 12th and invite a friend.